Shatter a mirror, and rearrange the pieces. What shapes will you find in the splintered glass? Sinister forces roam London’s streets, skulking through the neon-lit rain. They are not alone. Haunted by memories of the man who abandoned her, Amber goes walking in the deep night. The phone box she enters takes her on a journey she could never have imagined, one in which the past and the future will be rewritten. Others follow in her footsteps, their lives intertwining, and the fate of the world hanging on their dance. Safran, pawn of unimaginable powers. Jon, who has lived and died and lived again. Gloria, who only intended to annoy her daddy. Cory, from a different world, on a desperate quest for allies. They and others will find themselves swept up as the playthings of gods who have managed to get along peacefully for millennia — until now. 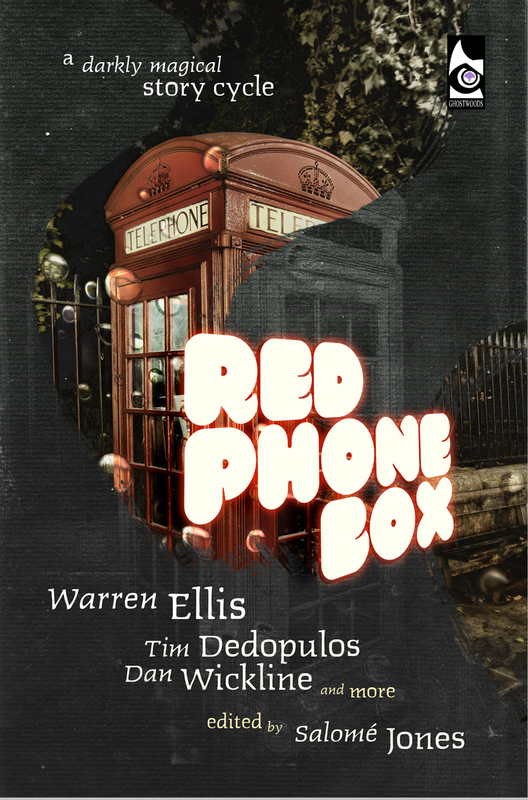 Red Phone Box is a darkly magical story cycle, a network of interweaving tales by a dazzling range of masterful authors, including Gun Machine’s Warren Ellis. Let them take you to a very different London — one that hides on the other side of the fractured glass. On the 28th of May 2011, I posted What a Little Moonlight Can Do, the first story in RED PHONE BOX. To my amazement and delight, many creative people from around the world saw the story and were inspired to write related stories. After hundreds of hours of editing work, Tim Dedopulos and I have built these stories into a story cycle. We’ve also sought out other writers to write additional stories to further develop the arc into something greater than the sum of its parts. Among the writers who have contributed to the project is the legendary Warren Ellis. In total, twenty-eight writers have contributed stories for the collection. We also have artist Kara Y. Frame and cover artist Gabor Csigas – who’ve contributed to the project. A story cycle has sometimes been called a collective novel. This arc of stories comes full circle with just a few weeks 'til the book launch.